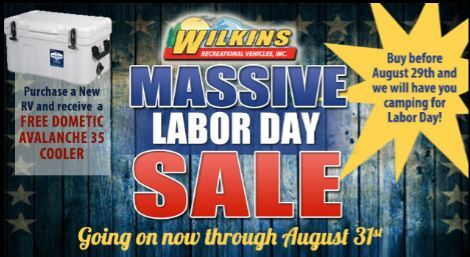 Labor Day is around the corner and here at Wilkins RV, we’re celebrating with a Massive RV Sale to celebrate Now Through August 31st! Purchase an RV before August 29th and we will have you camping in time for Labor Day! There’s still time to celebrate by camping with your friends and family! Looking for a Used RV? We have over 150 Pre-Owned RVs in stock starting as low as $3995! We’re slashing the prices on our entire line of Travel Trailers, Fifth Wheels, Toy Haulers, Destination Trailers, Class A and Class C Motorhomes. Whether you’re a family looking for just the perfect bunkhouse travel trailer, a couple looking for an extended living fifth wheel or craving a new adventure in a classy motorhome, we have just the right RV to fit your needs. 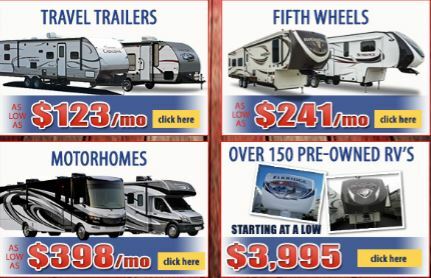 Choose from Over 350 RVs of every weight, size and floorplan. Our knowledgeable RV specialists will walk you through the different RV options we have available and help match you with your dream RV according to your specific travel needs. As an extra bonus, if you purchase a new RV during our Labor Day Sale, you will receive a Free Dometic Avalanche 35 Cooler! This quality cooler is just what you need to keep your drinks ice cold for years to come. Contact Us at Wilkins RV or stop by and visit one of our locations in either Bath, NY or Rochester, NY and one of our friendly team members will help you find the right RV at the right price. We’re here to help because we love happy campers. So, don’t wait, grab the family, hop in the car and pick out the perfect RV for your Labor Day weekend party. Start making memories today!